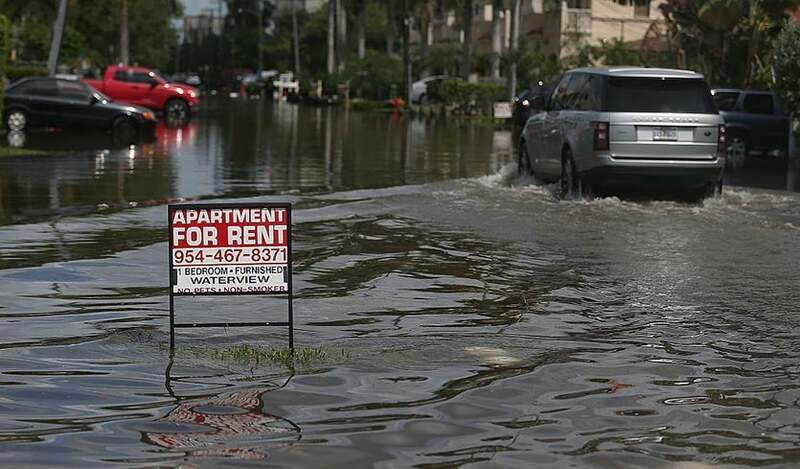 Above: A sign of the times: An apartment for rent sign is seen in a flooded street caused by high tide flooding on September 30, 2015 in Fort Lauderdale, Florida. Increasing sea levels due to climate change is likely to cause a major retreat from the coast in coming decades. Photo by Joe Raedle/Getty Images. Texas and Louisiana have the highest rates of sea level rise in the U.S., with Grand Isle, Louisiana (7.75 mm or 0.305 inches per year) topping the list, according to the annual sea level “report card” from researchers at William & Mary’s Virginia Institute of Marine Science. Rockport, Texas (south of Galveston) had the highest acceleration rate (0.240 mm/year2) of local sea level rise, due to rising seas combined with subsiding land (caused by such things as natural geological processes, ground water pumping, and oil industry activity). Figure 1. 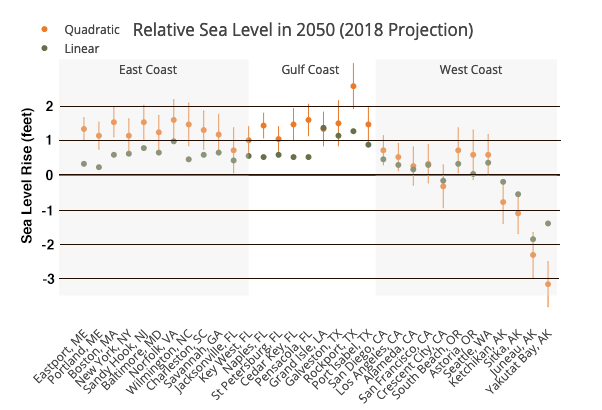 Predicted rise in relative sea level between 1992 and 2050 for 32 locations on the U.S. coast. The green dots are the predictions made using a linear model, which assumes that the rate of rise observed in 2018 will continue through 2050. The orange dots use a quadratic model, which assumes that the acceleration rate observed in 2018 will continue through 2050. Both estimates are likely too low at most of these locations, since melting of glaciers in Greenland and Antarctica is expected to accelerate in coming years. Image credit: sea level “report card” from William & Mary’s Virginia Institute of Marine Science. Figure 2. 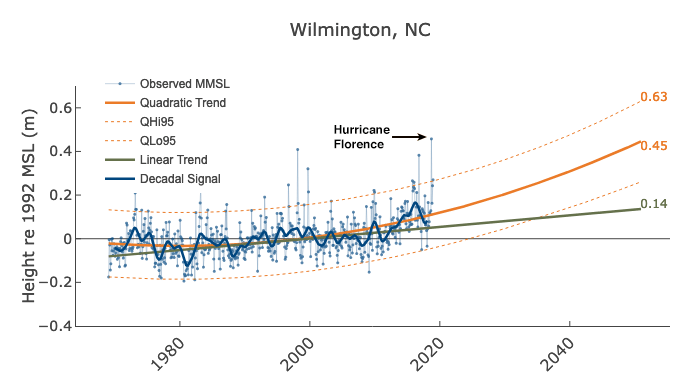 Observed sea level rise in meters since 1969 in Wilmington, North Carolina (thick blue line) along with projected sea level rise through 2050 using a linear model (straight green line) and a quadratic model (curved orange line). Confidence intervals of 5% and 95% are shown as dashed orange lines. Heavy rainfall in North Carolina contributed to high water levels at Wilmington throughout the fall of 2018, causing a temporary increase in sea level in Wilmington. The linear model predicts .14 meters (0.5 feet) of rise for the period 1992 - 2050, while the quadratic model predicts 0.45 meters (1.5 feet). Image credit: sea level report card from William & Mary’s Virginia Institute of Marine Science. Figure 3. 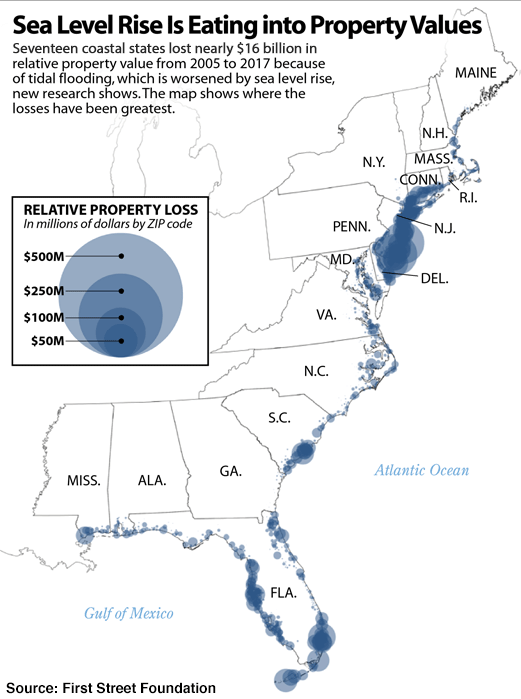 A February 2019 analysis by First Street Foundation of the estimated property value losses from coastal flooding in 17 states from Maine to Mississippi. “In the losing scenario, the more investors understand the risk of sea level rise to buildings and infrastructure, the less willing they will be to invest in the region. As people sell, the supply of houses and condos rises and prices fall. Property tax revenues decline. Even a modest drop has enormous consequences for the city and county budgets. This means cuts in teachers and cops and firefighters, but it also means less money to buy pumps, fix roads, build seawalls, and build and maintain all the other infrastructure needed to deal with rising seas. Instead of having the courage to raise taxes to make up for the shortfall, politicians, fearful of spooking the market further, fight to keep taxes low. 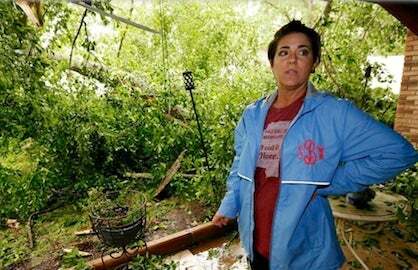 With no money for repairs or upgrades, infrastructure crumbles. And that, in turn, causes more people to sell, and the downward spiral continues. People with money leave, pirates and con artists arrive. Instead of innovation and civility, you get crime and lawlessness. Long before Miami is the New Atlantis, it will be broke and waterlogged and full of half-abandoned neighborhoods where mosquitoes breed and leaking septic systems turn Biscayne Bay into an algae-filled lagoon." To give us a fighting chance of avoiding the "flee in panic" scenario, we need to reform the National Flood Insurance Program (NFIP). The program is $20.5 billion in debt, even after cancelling $16 billion in debt after the hurricanes of 2017 (Harvey, Irma, and Maria.) NFIP encourages building in risky areas, and its premiums need to reflect the true risk of living on the coast. NFIP reform needs to be done carefully, though, since if insurance rates rapidy increase in high-risk areas, an economically devasting collapse of the real estate market might result. 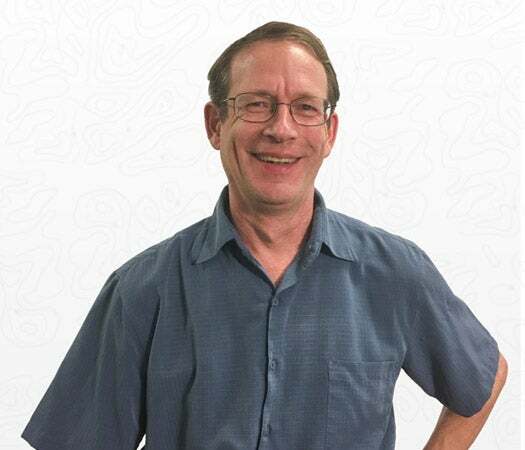 It is welcome, then, that bipartisan legislation was introduced on March 8 in the U.S. House of Representatives to establish a fund to provide low-interest loans to help property owners better flood-proof their homes and businesses. 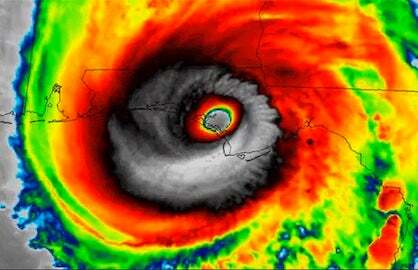 Those that do so would get a reduction in their NFIP flood insurance premiums. The State Flood Mitigation Revolving Fund Act of 2019 is designed to drive down flood insurance premiums and ultimately reduce post-disaster claims and recovery costs. 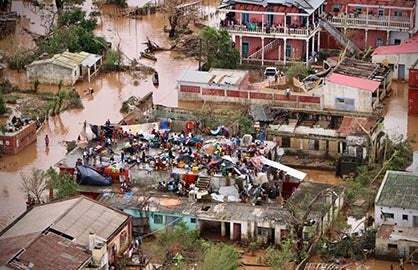 According to a 2018 report by the National Institute of Building Sciences, for every dollar spent on hazard mitigation, the nation saves $6 in post-disaster costs. Using Parking Meter Records and Tweets From Local Businesses for Sea Level Rise Research, our February 2019 post. Retreat From a Rising Sea: A Book Review, our February 2018 post. Sea Level Rise is Accelerating, Says Unnerving New Research, our February 2018 post. Why Is It So Hard to Fix the National Flood Insurance Program?, our November 2017 post. Blockbuster Assessment: Humans Likely Responsible For Virtually All Global Warming Since 1950s, our November 2017 post. Our December 2017 review of Jeff Goodell’s must-read book on sea level rise, The Water Will Come: Rising Seas, Sinking Cities, and the Remaking of the Civilized World. Also, see weather.com’s powerful 2017 report on Naval Station Norfolk (Virginia), a massive base that now experiences routine floods at high tide. Naval Station Norfolk could eventually see high-tide flooding 200 days per year, based on current trends.